Heat the oven to 350°F. Break the candy along the score lines into 24 sections. Break each section in half crosswise. 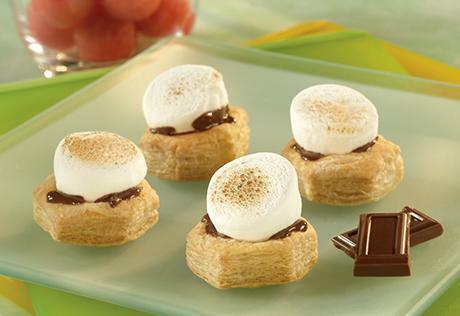 Layer 2 chocolate pieces and 1 marshmallow half in each pastry cup. Place the filled pastry cups onto a baking sheet. Bake for 3 minutes or until the marshmallows are lightly browned. Let cool on a wire rack for 5 minutes before serving.